The blogosphere has been blowing up these last few days with posts about New Years Resolutions. I'm not really a NYR-kinda gal, though. Ever watched the show Princess where Gail Van-Oxlade commands spoiled young girls through a budget bootcamp? It's filmed in Toronto and I love watching the girls' faces when they're told just how much money they'd have to make in order to afford their extravagant lifestyles. It's sort of like when people on The Antiques Roadshow think they have a seriously expensive heirloom and it ends up being worth, like, 5 bucks. Ha! Anyway, on that show, Gail says that the difference between a dream and a goal is a timeline. It's pretty much one of the more genius things that have come out of her mouth. Well, her perspective on dreams is my perspective on New Years Resolutions. The ones I've made in the past are often lofty "I'll eat better, exercise more, be nicer," but don't include a real game plan. By the time February rolls around, I've pretty much forgotten about them. That being said, I do like making goals. Oh yes. Goals are the BEST! Not only do you get what you've been working towards but ALSO the added BONUS of satisfaction. Satisfaction that floats onto my shoulders like a piece of responsibly-made silk. Okay, okay, so I'm in. However, instead of New Years Resolutions, I'm going to call them New Year Goals (oh yeah, I changed it). After much consideration, I decided that 2012 needed to have an overall theme. I like themes. They bring sometimes unrelated things together. Also, they put off vibes and I'm all about vibes. I thought and thought and though. Then, I came up with a BRILLIANT theme! I'd really like a year of stability. On all fronts. A year where nothing super exciting happens. I'm sure that Marc (The Hubby) would agree with me when I say that we could use a little LESS excitement. But stability itself isn't terribly interesting and although a tortoise's progress isn't great, they still move forward. 1. Finish my WIP and getting it ready to query by June. I plan to do this by writing at least 2,000 words a day, 5 days a week, when I'm feeling well. During my editing/revising stages, I will be going over at least 20 pages a day, 5 days a week, when I'm feeling well. 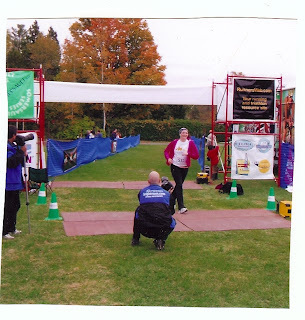 If I'm able to keep up that pace then I'll be good as gravy. I'm over half done my first draft now and usually write around 3,000 words a day, so by taking 1,000 off as my minimum, I'll be able to meet my quota - no problem. The writing's the easy part, though. 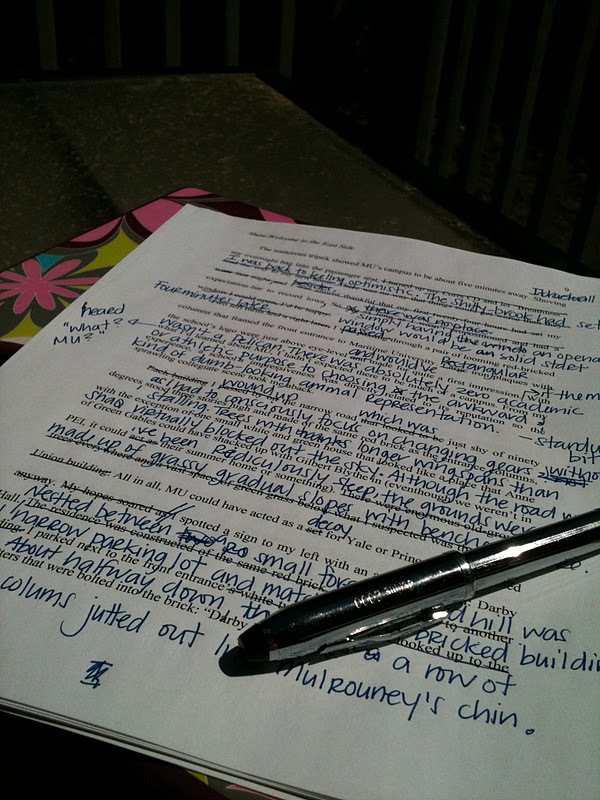 It's the editing/revising stages that take forever. Because each page ends up looking like this (from a MS I was editing/revising last summer). 2. I'm going to actively accept that I'm a writer. I've had problems with this the past few months and am in the middle of composing a post about my hangups. It has more to do with me being a coward more than anything else. Again, I'll explain my reservations about that later. As to the New Year Goal, I'm just going to fake it 'till I make it. Surprise question from the back: "Hey, what do you do?" Me, somewhat startled: "I'm a writer!" See, I'm off to a great start already. 3. Finish the Couch to 5k ap by the end of April. The ap actually takes 8 weeks, but since I'm in such awful shape and don't know if I'll be able to increase as quickly as "average healthy people," I've decided to double the timeline. At 30 minutes a day, 3 days a week, I think it's a realistic goal. 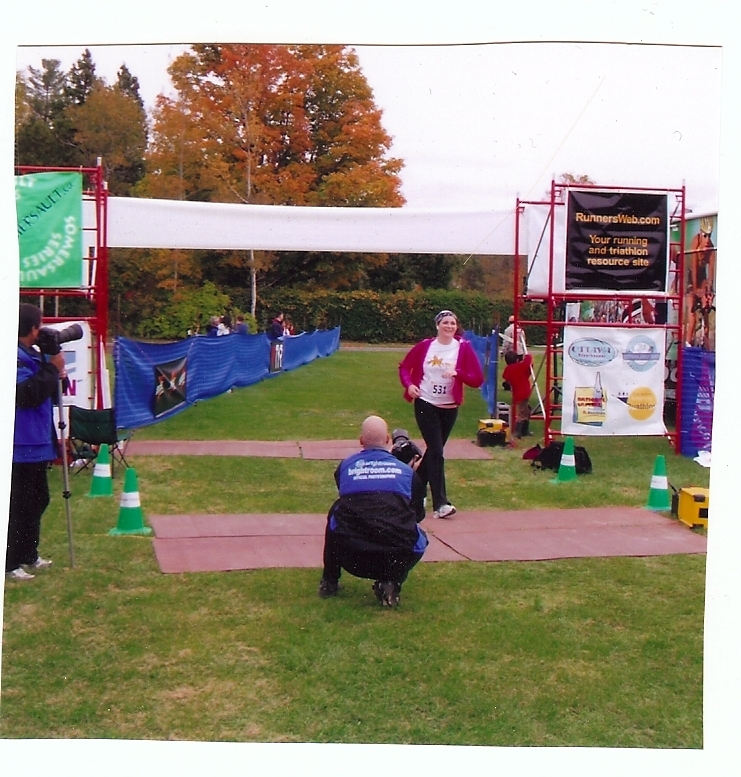 Me at the end of my first (and only) half-marathon approximately a thousand years ago. I want this feeling again. So I think that three is a pretty good start. The goals will be enough to keep me focused for the first part of the year, anyway, and I have a concrete plan on how to get them done within a specific timeframe. And each of them is at a slow and steady pace. Just like how this guy moves. Oh yeah, The Year of The Tortoise is going to be a good one. Love it. I have reservations about resolutions as well but i think its nice to set them anyway, better than not trying to turn around bad habits at all. TriGirl - YAY! Tortoise buddies! "We're buddies....special buddies."